Role: Molly is the Records Manager, a new role within the Archives and the University as a whole. Her primary role is to work with units across campus to help schedule the records they create, and help facilitate the disposition of records when they’re no longer active – whether that’s transferring them to the University Archives, or destroying them. Educational Background: She earned her MLIS from the University of Illinois at Urbana-Champaign in 2015. She also has a B.S. in Therapeutic Recreation from Southern Illinois University-Carbondale. How she got here: Prior to joining IU, Molly was working for the City of Berkeley in Berkeley, CA. They did not have an archives, but much of her work still focused on the identification and transfer of records and maintaining preservation and access. Prior to starting graduate school, Molly was working for a small business where she worked with government offices to digitize their historical records. That position initiated her curiosity, and a course in records management in grad school solidified her interest in the field. She also grew up in southern Indiana, and IU was always an exciting place to visit. It’s a great place to come to work every day. Favorite Collection in the IU Archives: Molly loves finding correspondence between individuals and offices on campus and the unique insight these records provide. They’re also a great reminder of the importance and value of capturing correspondence in the digital age. Current Project: Molly is currently updating our website with available information related to records management services and resources for IU. Favorite experience in the IU Archives: One of her first – working with offices across campus to remove older, inactive physical records from the IU Warehouse. It was a hands-on introduction to a variety of the content created by IU. The experience provided an opportunity to discuss the importance of records management and transferring records to the Archives. 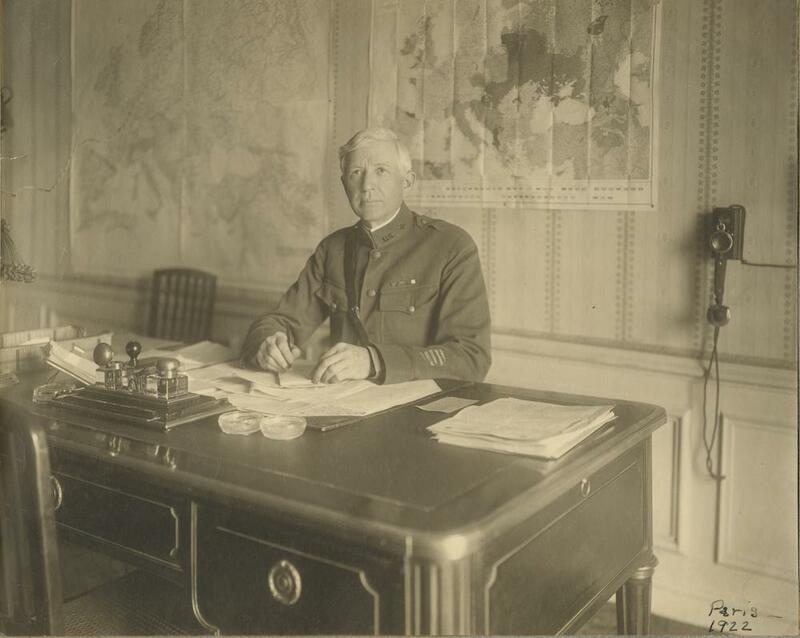 What she’s learned from working here: Quite a bit about alumni – most recently Ernest P. Bicknell and his role with the Red Cross during WWI. Contact the IU Archives to see the Ernest P. Bicknell papers. 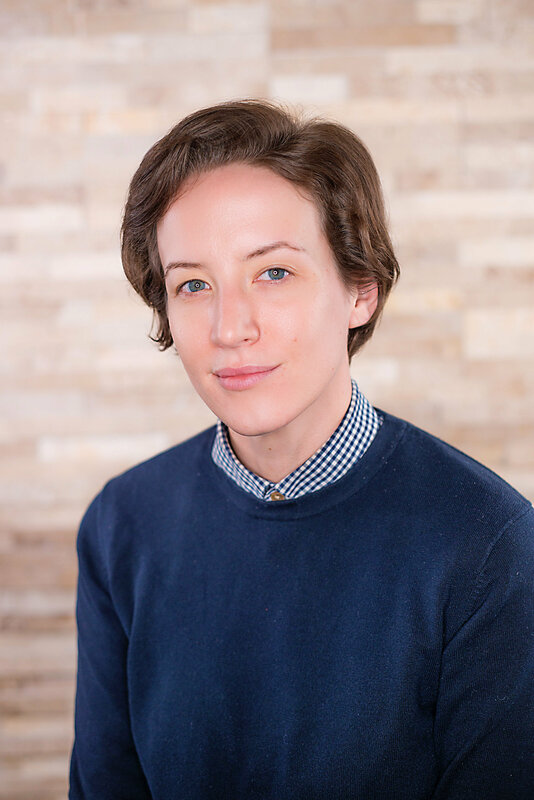 Previous Experience: Hannah worked in the Archives and Special Collections at Purdue University for two years as an undergraduate assistant for the Barron Hilton Flight and Space Exploration Archives. In addition, she spent one summer at the Indiana State Library through the Rare Books and Manuscripts Division. 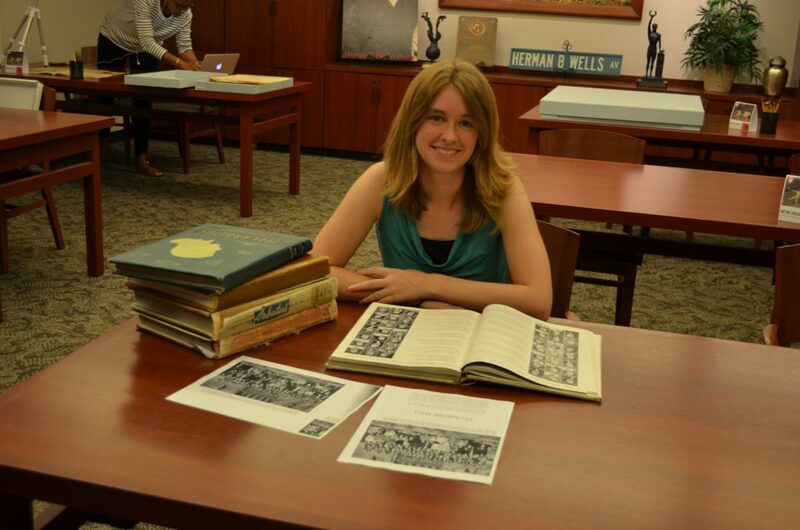 This past summer, she worked with the Loan Archives at the Smithsonian National Air and Space Museum in Washington, D.C.
Current project: Recently Hannah has been working to process the Eugene Chen Eoyang papers, who was a Professor of Comparative Literature and East Asian Languages and Cultures at IU. She also just installed an exhibit drawn from his papers. 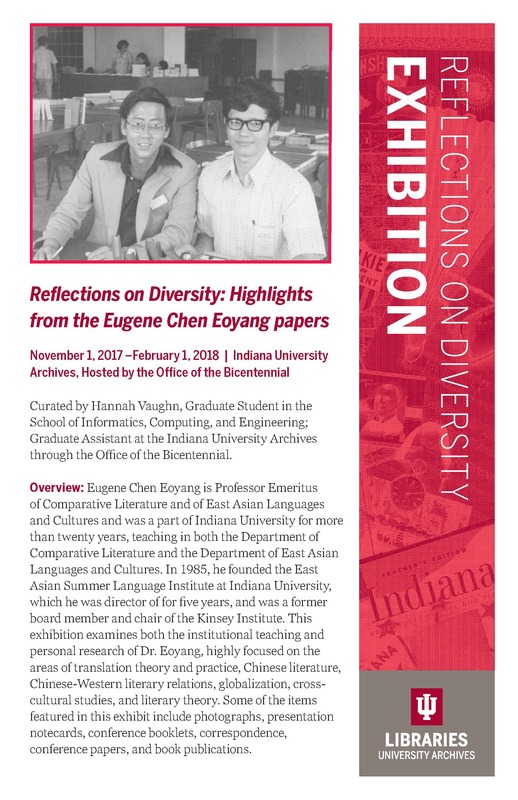 Visit the Office of the Bicentennial in Franklin Hall 200 to see “Reflections on Diversity: Highlights from the Eugene Chen Eoyang papers” through February 1, 2018. 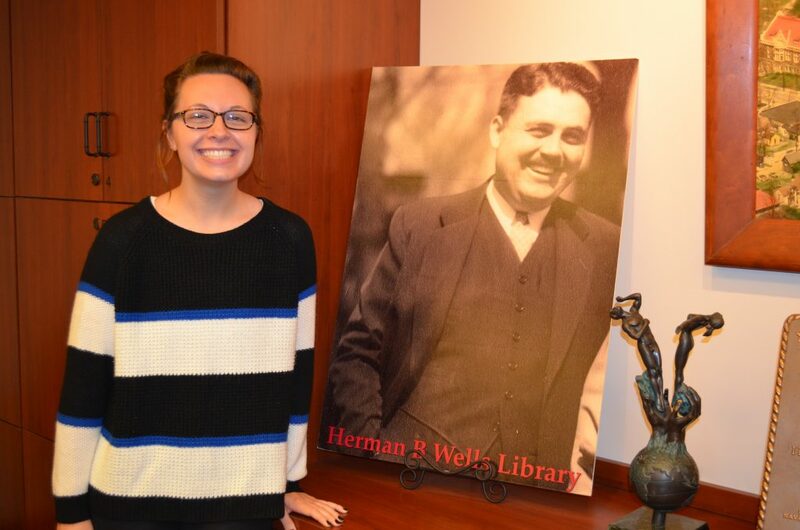 What she’s learned: The first president of IU, Andrew Wylie, died while in office. He accidentally cut his foot with an ax while out in the woods and then died a couple of days later from pneumonia. Educational Background: Tyler received his bachelor’s degree in English Literature from Miami University, Ohio in 2015. He is currently entering his second year of the Master of Information and Library Science graduate program at IUB, where he is specializing in Archives and Records Management. How he got here: This is Tyler’s first time working in an actual archives. Before he joined the MLS program, he spent a year volunteering for the special collections department of a library in Ohio, where he was able to process an amazing collection of memorabilia from a World War I aviation historian. He also worked for a digitization project in undergrad where he scanned and preserved photographic negatives from the 1940s-1960s. These experiences helped him to know that archival work was something that he wanted to pursue further. He has been studying archives and records management in the MLS program and when it came time for an internship, Tyler wanted to get as much hands-on experience in these areas as possible. When he spoke to the staff at the IU Archives and learned that he would be able to work on some great projects with both an archivist and a records manager, he knew he’d found the right place! Favorite Collection in the IU Archives: Tyler’s favorite item(s) that he has encountered in the Archives so far is the Kathleen Cavanaugh scrapbook collection (C617). 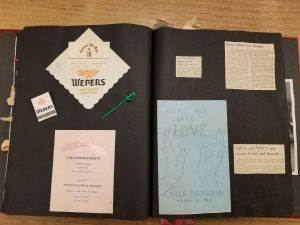 Cavanaugh made these scrapbooks by hand as a student at IU in the early 1960s, and they are full of amazing memorabilia from that time – everything from photographs and cards to matchbooks and corsages from school dances. These scrapbooks are fun to flip through, and it is a very unique and personal way of interacting with the IU student experience of the 1960s. Current Project: There are quite a few projects in the works! Tyler has been doing some web archiving work, including crawling and preserving all IU-affiliated social media accounts on Archive-it.org (see his previous post “Tweeting and Pinning: Archiving IU’s Social Media sites” on that project). He has also been processing a few incoming collections, as well as imaging born digital media in the Born Digital Preservation Lab. 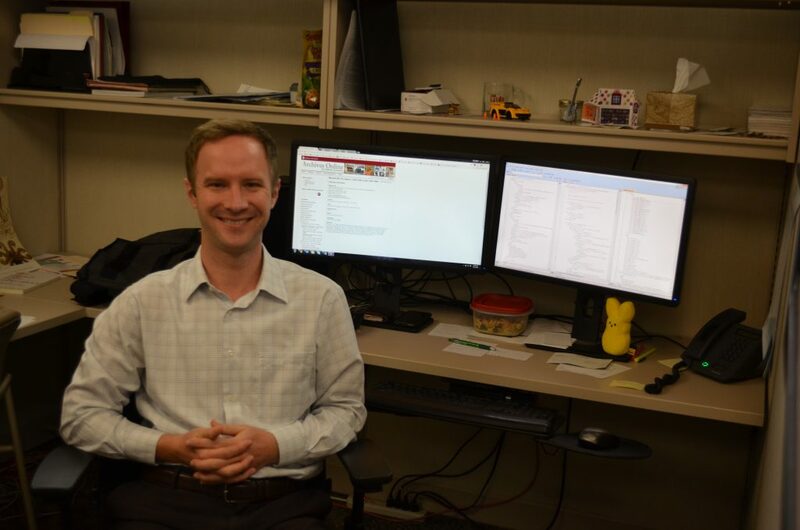 Recently, he began doing research into state laws and University policies to help compile a records retention schedule for the School of Informatics and Computing as they prepare to make the big move into Luddy Hall this winter. Favorite experience in the IU Archives: Tyler’s favorite experience has been getting to know the staff, who are great to work with and are excellent at what they do. He is glad to have had the opportunity to learn from their example! 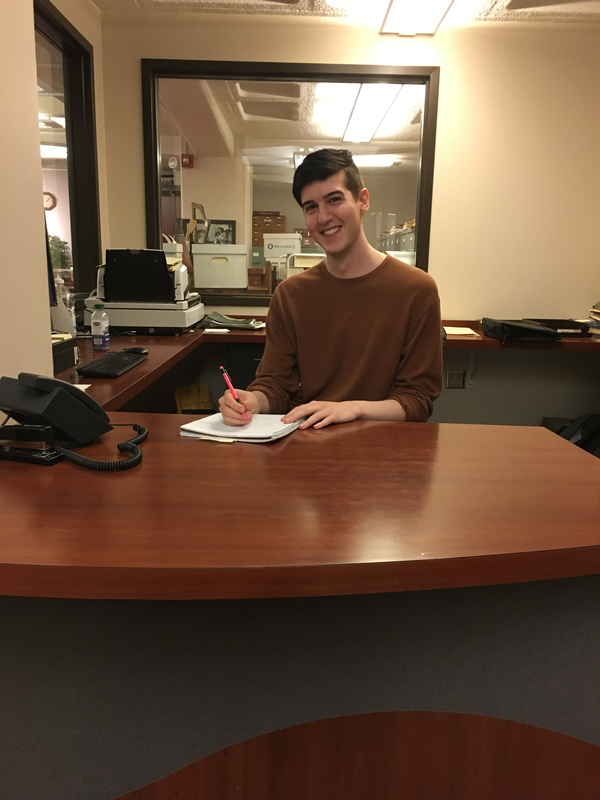 What he’s learned from working here: In addition to learning many useful archival practices, Tyler has also picked up some fun facts about IU history by working with the collections. For example, when he was processing the Institute for Urban Transportation records (C682), he learned that Bloomington’s first public transit system was established in 1973 by a collaboration between the institute’s founder, Dr. George Smerk, and a geography professor at IU, William R. Black. In the University’s early years, the city and the campus were obviously small enough for students to get around without automotive assistance, so he thinks this goes to show how much the University has steadily grown and expanded over the years.